Join the discussion on our forums! Come discuss Ursatron over in our dedicated Ursatron discussion topic. 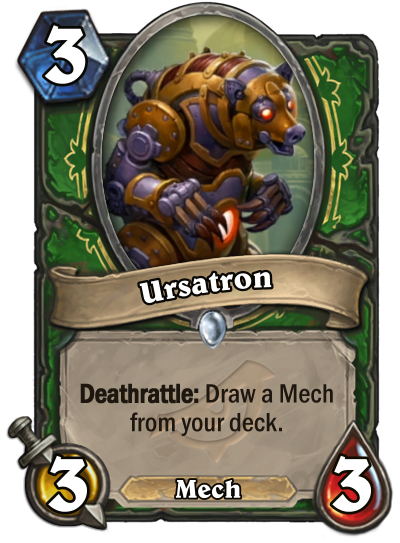 Deathrattle: Draw a Mech from your deck. It's been programmed to include all the bear necessities. Good replacement for Piloted Shredder if you don't like the guess work involved with that card. This, Nine Lives and Oblivitron creates a great draw engine. A draw engine that Hunters lack for so long. These three cards should make Mech Hunter viable. I’m excited! Hmmm... What mech does Hunter really want to tutor? Ursa, is that you ?? Though there are Ursas in WoW, none of them look anything like this or have the same color scheme. I think this is a fairly definite nod to Dota 2's Ursa. It is most likely a reference to Magic the gathering.